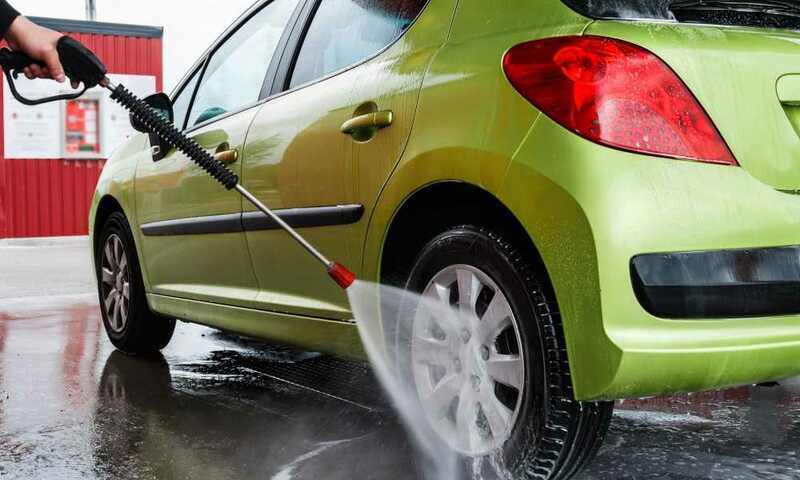 Pressure washers for general home use such as washing your car and cleaning gutters do not use as much water as one would expect. 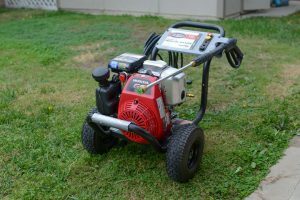 Even when opting for a high-end pressure washer, units which are commercially available typically have a gallons per minute (GPM) flow which is low enough to be near negligible. Here we’ll be taking you through a look at the GPM of your average pressure washer while evaluating the amount of water which each machine uses. 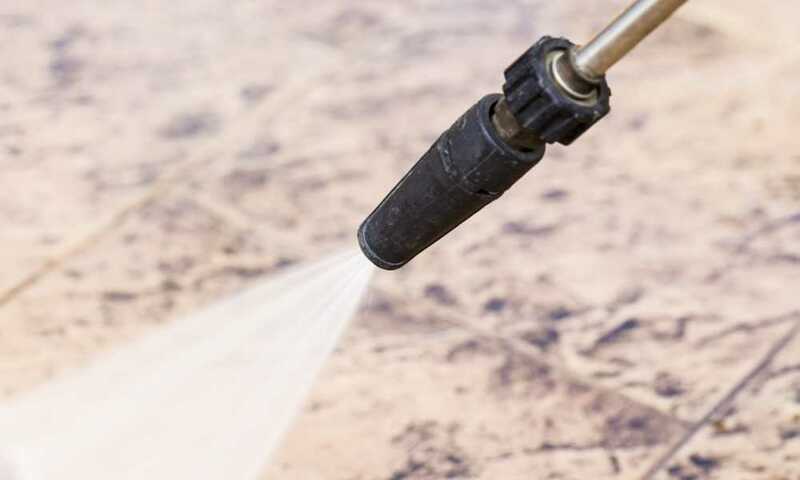 The average good-quality high-pressure washer designed for home use will give you a 1.8 GPM which translates to a maximum pressure of 2100 PSI. High-pressure washers work by taking the standard flow of a faucet which equates to 10 gallons per minute and placing it under pressure which reduces the flow. 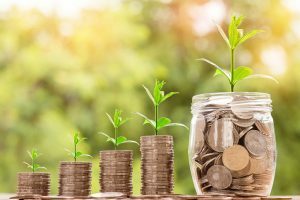 You can therefore never use more than your outlet puts out which is 10 gallons per minute, or 100 gallons of water for a ten-minute car wash. 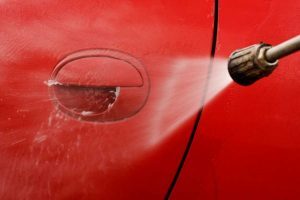 Many pressure washers feature an automatic shut-off valve which prevents the continuous flow of water while washing your car or other area. 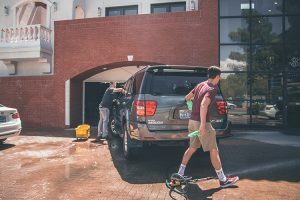 Such features make a dramatic difference and are reported to save up to 70 gallons of water for each 10-minute car wash.
Commercial pressure washers compress the flow of water from an outlet immensely. The best pressure cleaners will drop the flow from a faucet to around 5 gallons per minute. This is the average which you can expect from a 4000 PSI cleaner although their cost puts them out of reach of regular consumers. 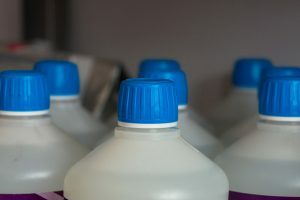 If you wash carefully and only release as much water as is needed, experts estimate that you can get away with between 9 to 15 gallons of fresh water during each cycle. This is not too hard to achieve. 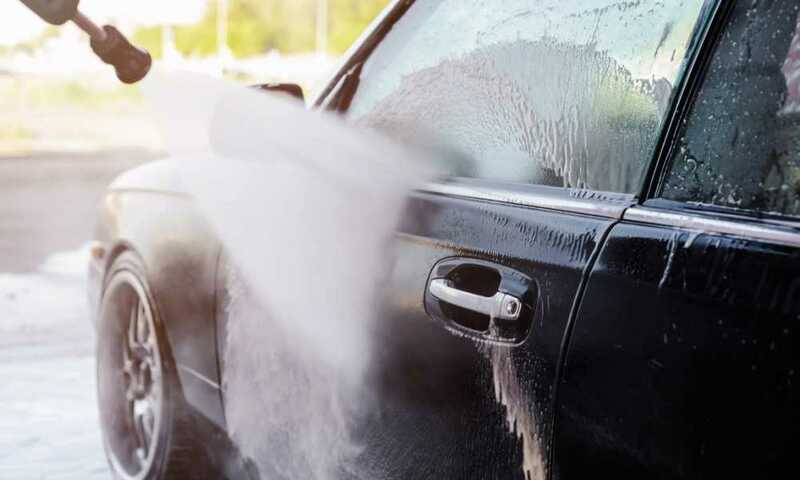 All that you need to do ideally is give the car a light pre-soak with a wide spray before applying detergent. With a foamer attachment, this is very quick and takes very little water before your car is covered. After a few minutes you rinse it all off and your car is ready. As you can see, the amount of water used is minimal. The higher the pressure of your washer the more water efficient it is. Always look for the highest PSI and relative GPM to guarantee effective use. Most leading high-pressure washers will end up costing you around 8 gallons of water per minute, with the best out there reduce this to around 5 gallons per minute. High-pressure washers don’t cost you more money in water they dramatically reduce your water usage. 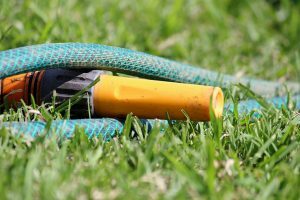 You can expect a saving of 75% or more when washing using your high-pressure washer instead of a standard hose. A hot water pressure wash will get your surface clean far faster than using cold water. This translates to far less water used overall. Similarly, detergent also aids the process helps you clean faster and thus use less water. 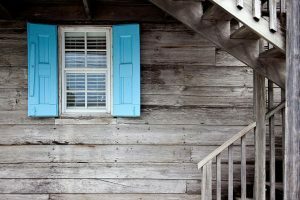 The key is being as practically efficient as you can to reduce the amount of water that you need to wash away dirt, grease, and grime. The better you use your pressure washer the less water you’ll need to get the job done. You don’t always need detergent and when this is so a quick wash is far more water efficient than wetting, foaming and rinsing. In other scenarios, detergent will rapidly improve the process. The type of nozzle that you use also makes a difference. There is no point in struggling with a wide jet when a 0° stream will cut through the grime and break it down far quicker. Shorter working times reduces strain on your pump motor and saves water. 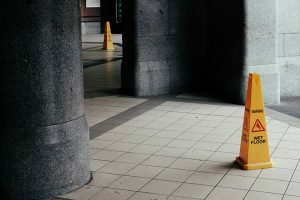 If a surface can be treated with a specialized cleaner before blasting it with your high-pressure hose wand, then go for it. There is no point to struggling with stubborn grease when a degreaser melts away the problem. The more frequently you use your pressure washer the more intelligently you’ll begin to implement its uses translating to even less water used to get each job done. 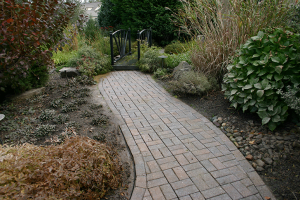 A pressure washer will reduce your water consumption gradually as you become more accustomed to using it. It doesn’t take a constant flow of water from your faucet to deliver immense cleaning power which is ever-versatile. 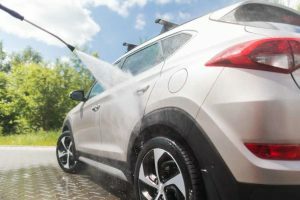 All it often takes is a quick soak of foam and a few high-pressure blasts to rinse away the suds and any area or object is left squeaky clean using very little water overall.